ISELIN, NJ--(Marketwire - September 24, 2010) - New Jersey couples planning an upcoming wedding will receive his and her iPads when they book their wedding festivities at the Renaissance Woodbridge Hotel now through March 1, 2011. Couples will find the hotel offers unique and elegant settings along with luxury amenities, distinctive accommodations and unsurpassed services to create a perfect Woodbridge wedding. This offer is in celebration of the Edison, New Jersey hotel's opening after completing major renovation of its more than 300 guest rooms and suites and upgrades to its more than 25,000 square feet of flexible event space. Couples in Iselin, Woodbridge, Central/North New Jersey and Staten Island, NY will find the Renaissance a great location for their upcoming wedding and can enjoy a fabulous gift that will help in planning their upcoming event. Couples who sign a contract and provide a 20% non-refundable deposit with the Renaissance Woodbridge Hotel to host their wedding will receive matching iPads* fully equipped with the ability to download the wedding application to help plan a dream wedding. Additionally, Renaissance Woodbridge is offering "rolled back pricing" with packages beginning at $79 per person on select Friday and Saturday 2011 dates. All packages include five-hour events, floor length linens, discounted overnight accommodations and a one-year anniversary stay! Edison hotel deals like this Renaissance wedding package are perfect for creating memorable lifetime events at affordable and budget-friendly prices. More information regarding this unique iPad wedding package may be obtained by calling 732-510-2125 or visiting the hotel's website at www.renaissancewoodbridge.com. 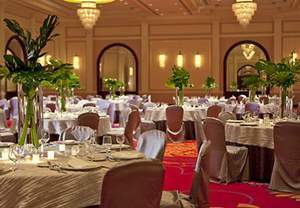 From small intimate gatherings to large, elegant events, the Renaissance Woodbridge Hotel, with 15 event rooms and its elegant Diamond Ballroom, is a sophisticated choice among New Jersey wedding venues. Woodbridge guests will be treated to the creative talents of full-service catering teams and couples will be able to rest assured every detail is perfect, thanks to the professional talents of the hotel's certified wedding planners. From a bridal party luncheon or rehearsal dinner to a light buffet or elegant meal, the catering staff at the Renaissance has the ideal menu to match the occasion. *All contracts must be signed by 3/1/11 and accompanied with a 20% non-refundable deposit to qualify. A minimum spend of $10,000 required for one iPad or $15,000 to receive his and her iPads. The Renaissance Woodbridge Hotel is centrally located near Edison, NJ, and just 15 minutes from Newark Liberty International Airport. The hotel provides full-service accommodations to business and leisure travelers, with easy access to many corporate offices and popular attractions. In addition to well appointed guest rooms and suites, the hotel is home to OLIO Restaurant and Lounge in Iselin, which offers an American menu for breakfast, lunch and dinner. Guests will also have access to the hotel's heated indoor and outdoor pools and an on-site fitness center.